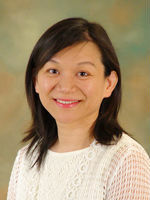 Dr. Ya-Chin Lan started learning piano since a child and spent most of her childhood and youth in learning and teaching as well as serving in church. Nowadays, her childhood and youth in learning and teaching as well as serving in church. Nowadays, her broad background has stimulated her desire to bring music to glorify God and to edify people. Not only does God put such a burden in her heart, but He also gives her a chance to teach piano and music theory in Overseas Theological Seminary. Dr. Lan’s deep knowledge of musical education is an indispensable gift to OTS. The art of worship has been truly revived in her thought-provoking classes. Her winsome smile and gentle personality have been the stimulus to musical interest at OTS. Yet, appearances do not tell the full picture. She is also a professor with many firm and admirable principles that have won both the love of her students and respect from her colleagues. As a result, many students look forward to her classes even with their busy academic calendar. A few of those theological students who choose piano classes have a solid foundation of music, but many of them are complete lay people who have a very limited understanding of music. With over 20 years of piano teaching experience, in-depth research during the academic years of piano pedagogy D.A. in the University of Mississippi, and her proficiency in various kinds of music teaching methods (such as Suzuki, Orff, and Kodaly, etc. ), Dr. Lan is able to offer a tailor-made study plan for each student. She endeavors to understand each student’s talents, learning status, personal goals and background, so that she can provide the most effective curriculums in the shortest amount of time. lead and conduct a choir as well as interpret sacred music. Even though not everyone will serve in music ministry, but by learning music theory, many students get to know the significance of music ministry to church. As a result, they will inspire and cultivate church music coworkers in the future. Perhaps someone might ask, “Wouldn’t it be too late for an adult to start learning music?” In her experience, Dr. Lan feels strongly that human’s God-given ability to understand and excel in music is not limited by age. God inspires many theological students, allowing them to naturally compose praise songs. She has seen God help those who can’t even read music to be capable of doing piano accompaniment following such a short learning period. Throughout her joyful teaching, Dr. Lan is grateful to God for giving her such a wonderful husband who not only inspires her to grow but encourages her to serve God. Now that they have a one-year-old son, Dr. Lan likes to bring the little one, Philip, during her little spare time, to meet other parents so that she can share the gospel with non-believers while building up other Christians. Her family life and ministry keep her theoretical work firmly planted on the ground. Her activities in the church allow her to keep an eye on how music is continuously influencing the greater church. Her concern for relevance always shines through in the classroom. Lest someone mistakenly thinks that Dr. Lan is merely an academic, she is so much more. Even as a busy professor, mother and wife, she freely volunteers her time for other activities beyond her seminary teaching by leading a music program for the kids between the age of 0 and 3 in a church fellowship. The program has gained favorable review and attracted many non-Christian mothers. As a direction expression of her warm and compassionate personality, her music-for-tods program gives her the greatest joy. As a visionary for linking a sound musical education with church ministry, Dr. Lan has started some interesting and innovative writing projects. Presently, Dr. Lan is compiling her experiences and ideas from piano teaching in OTS into a systematic piano curriculum, mainly for the church pianist's needs. She hopes it can be a self-learning tool for all Christians who want to become church pianists. As a side benefit, she hopes for her writing project to serve as an instruction manual for other churches to train and nurture their pianists. On top of her work in piano, she is also designing teaching materials of music theory for choir Director and coworkers. Copyright © 2018 Overseas Theological Seminary. All rights reserved.